The UK Coffee Week has drawn to a close and we’re proud to have supported clean water initiatives through Project Waterfall in Ethiopia. For every coffee bought last week, Crêpeaffaire donated 5p to this fantastic cause. In total, we raised …. A big thank you to everyone who helped us reach this figure! This donation will help to support communities that need it most via Project Waterfall. Don’t forget, you can still get your FREE Crêpeaffaire coffee before 11.30am every weekday when you buy any brekkie crêpe. 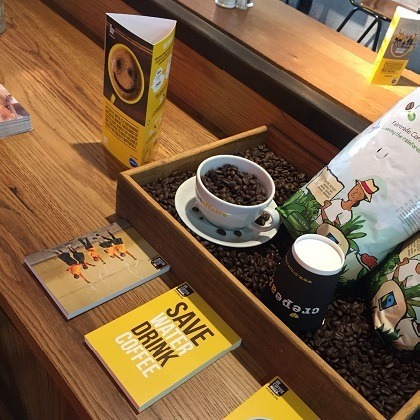 UK Coffee Week brings coffee communities together across the country to help raise funds for Project Waterfall. This is an initiative which supports coffee growing communities and brings them clean water facilities.